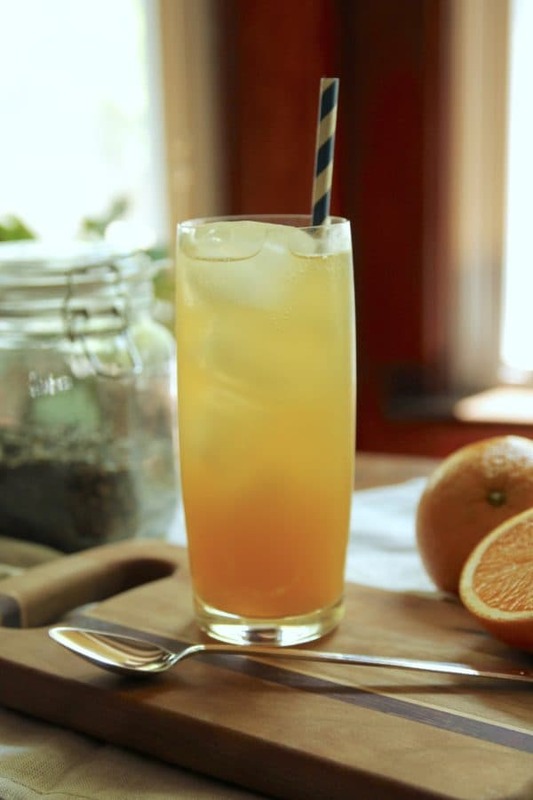 This Sparkling Green Tea recipe is the perfect summer refresher; green tea, fresh orange juice and a few bubbles make for a combination that is as delicious in the morning as it is on a hot afternoon. I’m posting a recipe. Can you even believe it?? Perhaps the odd thing is that it didn’t come back in the form of cookies, cake or pie – it came in the form of green tea. It is possible that I’ve been body-snatched, but only time will really tell. Anyone who knows me knows that I am not a coffee drinker. Never have been. I don’t really care for the taste of it, and my stomach can’t really handle the acidity – not to mention that the caffeine makes me buzz around like one of those little wind-up toys. It’s not cute. But tea? Tea I love. For me, a great coffee shop needs to have a great selection of tea as well, which I understand is perhaps a bit counter-intuitive, but that’s just what I like. The other day I was having dinner with a friend and stopped by Zion Coffee Bar, a new coffee bar in the area, on the way home and discovered the beauty of sparkling tea. I was instantly hooked and had to come home and recreate it for you. 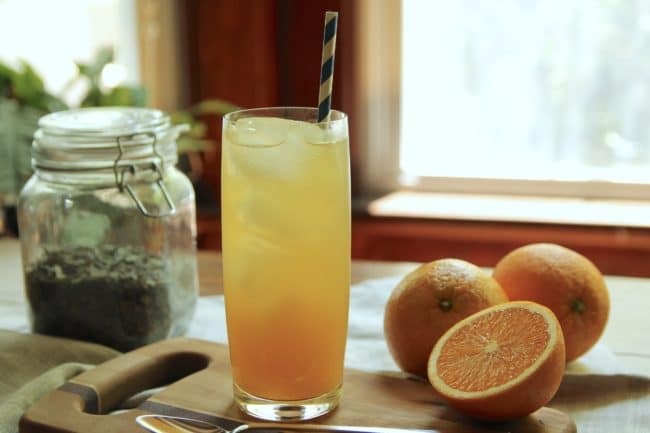 This is easy-peasy, guys, and is seriously so refreshing for a hot summer day: concentrated green tea and freshly squeezed orange juice topped off with sparkling water for a little fizz. That’s it! Yes, I do recommend using tea leaves to brew the green tea concentrate. Sorry to sound like a snob, but tea leaves just make for better tea. If you do want to use tea bags, just use twice as many as you would to brew a normal cup of tea, since you want the concentrate to be nice and strong. For the actual Sparkling Green Tea recipe itself, you’ll notice I don’t give you measurements, but rather list it in parts. This is because you can make as little or as much as you want at once. Make one glass or a full pitcher – it’s really a choose-your-own-adventure situation. I don’t particularly like my tea very sweet, so the only sweetness here comes from the orange juice itself. If you want to make this a little sweeter, you could always add simple syrup to taste. 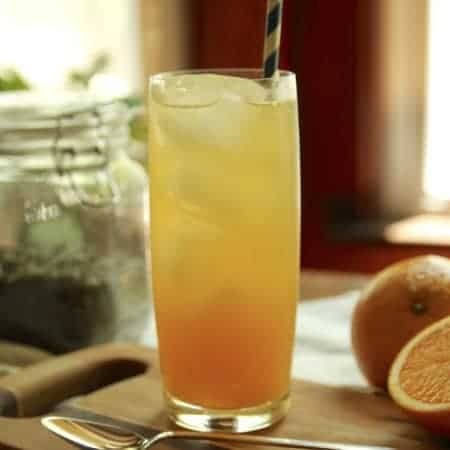 Here’s a good tutorial on how to make simple syrup on The Pioneer Woman’s site. Want to explore more tea recipes to cool you down? Try my Homemade Chai Concentrate recipe, too! Pour the boiling water over the green tea leaves and allow to steep for about 4 minutes. Strain, store in a jar and chill in the refrigerator until ready to use. 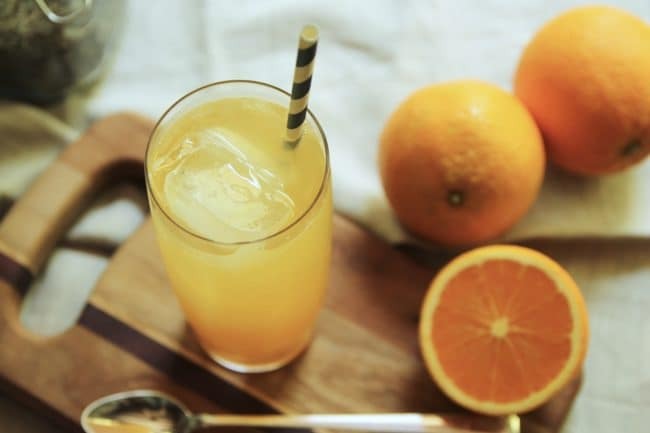 Over ice, add chilled Green Tea Concentrate, orange juice and top with sparkling water.